Hangover Square; "Concerto Macabre"; Citizen Kane. Orla Boylan, soprano; Martin Roscoe, piano; Rumon Gamba, BBC Philharmonic. Chandos CHAN 10577. Conductor and composer Bernard Herrmann (1911-1975) got his big break in Hollywood when Orson Welles asked him to do the score for his 1941 classic Citizen Kane. According to Herrmann, that was his best music ever, and it was downhill thereafter. He was teasing, of course, but he had a point. His soundtrack score for Citizen Kane really is among the best music ever composed for any motion picture, maybe even surpassing Herrmann's work for Hitchcock on films like Vertigo and Psycho. Oh, sure, there are more individually memorable movie themes one can name--Gone with the Wind, Doctor Zhivago, and the like--but I can't think of a single movie with such a large collection of remarkable music cues for specific characters, scenes, and sequences as Kane. 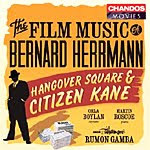 Anyway, the present disc includes Herrmann's scores for two movies, Hangover Square and Citizen Kane, both performed by conductor Rumon Gamba and the BBC Philharmonic as though they were doing them for the movies' original soundtracks. I suspect they've done this kind of thing before. Hangover Square (1944) is all dark, moody, and eerie, a film-noir murder mystery in the mold of The Lodger or Dr. Jekyll and Mr. Hyde. The main character is an unhinged concert pianist, giving Herrmann a chance to compose not just a bleak, spare, atmospheric background score but a brief piano concerto as well. It was all the rage in the early Forties to include pseudo piano concertos in movies, ever since the resounding success of the popular Warsaw Concerto in 1941's Dangerous Moonlight. 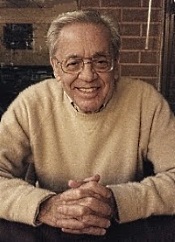 Herrmann wrote his own mini concerto in the style of Liszt's Totentanz, and Stephen Sondheim has said that Herrmann's music for Hangover Square was a major influence on his writing for Sweeney Todd. Interesting how art imitates art. After the music for the movie, pianist Martin Roscoe performs the twelve-minute Concerto Macabre with the BBC orchestra, and heard in its entirety the Concerto turns out to be not bad at all, although a rather gloomy affair as the title indicates. The real star of the show, however, is the music for Citizen Kane, almost fifty minutes of it. Herrmann used the old idea of the leitmotif in the movie, the association of a musical theme with a particular character or scene. In this case, he says he used several notes from the ancient hymn Dies irae repeated throughout the film. Gamba and the BBC Philharmonic do the music justice, big and melodramatically or hushed and subdued as the occasion demands. If you are at all familiar with Citizen Kane, as I imagine most readers of this site would be, you can easily picture each piece of action as you listen to the music. Chandos recorded the album in 24-bit/96 kHz sound to good advantage. The 2009 studio sonics are as bold and momentous as the music (and as spare and chilling when it needs to be). The audio engineers mike it fairly close up for maximum impact and effect. There's a very wide stereo spread, good definition, if a little overly sharp at times, with still a reasonably decent orchestral depth. The sound reminds me somewhat of Decca's Phase 4 recordings of the Sixties, although not so compartmentalized, prompting me to put on and listen to several remastered Phase 4 discs I own that also feature the music of Bernard Herrmann. Of further merit, the Chandos disc contains over seventy-seven minutes of music, a healthy dose, and includes a beautifully illustrated booklet insert of notes and information. Also, Nocturnes and Prelude a l'apres-midi d'un faune. Andre Previn, London Symphony Orchestra. EMI 0946 3 91966 2 3. You'll want to buy, borrow, or hear this reissued album if for no other reason than to enjoy Previn's reading of Debussy's Prelude a l'apres-midi d'un faune. It's one of the most sensuous, sinuous, intoxicating versions on record, and it leads off this all-Debussy album. You'll find it at once an impressionistic aural fantasy and a literal sound picture, music filled with as much feeling as description. Next up are the Images for Orchestra--crystalline, sparkling, every facet a shining gem. But here's the funny part: It was the first time that EMI had recorded digitally, and according to the conductor, "the Japanese gentleman running the machines said to me that it would be very difficult, and costly, to make intercuts. ...And we went out and played 'Gigues,' and then all the other pieces, in one--and that's what you hear on the record." Finally, we get the three Nocturnes, three more short impressionistic tone poems, which began life as "Three Twilight Scenes" but turned into a study of the color grey, a noisy public festival, and a song of the ocean and mermaids. Lovely works and lovingly interpreted. EMI originally made the recordings in 1979 and 1983 and repackaged them in 2007 in their "Great Recordings of the Century" series. They appear to be the same as the company released earlier in several other LP and CD issues. There is no mention on the back of the case or in the booklet insert about using Abbey Road Technology to reprocess the sound. I suppose the idea is that the digital recordings were good enough to begin with, and no further fiddling with them was necessary. Certainly, the music still sounds splendid--nuanced yet dynamic, delicate yet robust, and well detailed all the way around. 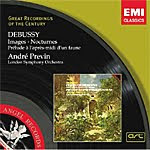 I know there are other fine recordings of these Debussy works on disc, from the likes of Haitink (Philips), Martinon (EMI), Argenta (Decca), Simon (Cala), and others. But it's hard to find such a good combination of performance and sound as you'll find here in this Previn re-release. Mikhail Pletnev, Russian National Orchestra. PentaTone Classics PTC 5186 362. In the latter part of the nineteenth century, Nikolai Rimsky-Korsakov (1844-1908) was a part of the circle of Russian composer's known as the "Mighty Five" (the others being Mily Balakirev, Caesar Cui, Modest Mussorgsky, and Alexander Borodin). They aimed to produce a specifically Russian form of music, and certainly much of their influential output remains well known today, even if it's only in bits and pieces. For example, my guess is that beyond Scheherazade, Capriccio Espagnol, and maybe the Russian Easter Festival Overture, most casual listeners these days probably wouldn't recognize much by Rimsky-Korsakov. This present disc aims to rectify that situation, at least to a small degree. 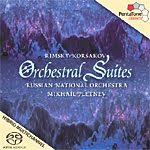 Mikhail Pletnev and his Russian National Orchestra play suites of four and five movements each from three of Rimsky-Korsakov's operas. The operas themselves may not get performed much anymore, but the orchestral arrangements the composer himself extracted from them live on quite comfortably. Things begin with the four-movement suite from the opera Snow Maiden. It's a short piece, about eleven minutes in all, but it's quite colorful, evocative, and entertaining, especially under Pletnev's elegant direction. It's mostly sweet, gentle music until the final movement, "The Dance of the Tumblers," which gets a bit more rambunctious. Next up is Legend of the Invisible City of Kitezh, again in four fairly brief movements. More so than in Snow Maiden we hear the composer creating sound pictures, even to the chirping of birds in the background, and Pletnev emphasizes all the music's most pictorial elements. Although it may be lightweight, the music is quite charming, and Pletnev forges into the third-movement battle scene with relish, concluding the work with a richly embroidered "Funeral" sequence. Finally, saving the best for last, Pletnev gives us the longest (five-movement) and most-memorable of the suites, "Night on Mount Triglav" from the third act ballet-opera Mlada. This suite has an almost Wagnerian scope to it, which Maestro Pletnev is quick to exploit. The music goes so far as to involve mortals and gods, as does much of Wagner's music. The difference is that Rimsky-Korsakov seems more interested in painting soft pastel watercolors than in creating vast Wagnerian canvases in oil. Here, we get visions of spirits and apparitions rather than thunderbolts and Valkyries. Pletnev lets all the guns loose, though, in the third movement "Witches' Sabbath" when the god Cernomor, the immortal Kashchei, and Cleopatra all appear. The action ends in a burst of sunset and then a relative calm. PentaTone offer the sound in regular two-channel stereo, SACD stereo, and SACD multichannel on the same hybrid disc. The recording, made in 2009, comes up nicely detailed and with a reasonably good depth of field. There is little of the enshrouding fog we sometimes hear in SACD surround-sound recordings. There is, nevertheless, the faintest hint of low-frequency background noise noticeable on occason, usually during the quietest moments. A moderate dynamic impact and a wide stereo spread complete another fine recording from Pletnev and his players. Chicago, Nov. 29, 2009. Cedille Records, the Grammy Award-winning, internationally distributed classical record label born two decades ago in a student apartment on Chicago's South Side, embarks this month on its 20th anniversary year. Cedille (pronounced say-DEE) made its debut in November, 1989, with its first CD release, a program of solo piano pieces performed by Chicago-based Soviet émigré pianist Dmitry Paperno. With that initial, small-scale project, Cedille founder James Ginsburg, then 24, launched the first Chicago-based classical record company since the heyday of Mercury Records in the 1950s and 60s. Since then, Cedille's catalog, which features world-class musicians in and from the Chicago area, has grown and diversified, while attracting critical accolades, an international clientele, and praise from its artists. Cedille has 115 principal CD titles ranging from solo keyboard works to complete symphonies and operas. These include world-premiere recordings and CD premieres of important compositions, plus the commercial recording debuts of some celebrated artists. A point of pride for the label is that its regular music downloads are 256 kbps MP3 files, twice the industry standard for sound quality. What's more, in the coming year, Cedille plans to offer premium-priced CD-quality digital downloads in the lossless FLAC format via its Web site (http://www.cedillerecords.org). In addition, Cedille recently launched a "free-download-of-the-week" feature on its Web site and released a 20th anniversary sampler CD available free to purchasers of physical Cedille CDs in the U.S. and Canada. "I'm still pinching myself," Ginsburg says, as surprised as anyone that the entrepreneurial sideline he launched as a first-year law student at the University of Chicago would evolve into a record label of international distinction--and that his life's work would be as a classical record producer and label impresario rather than a lawyer. Ginsburg, now 44 and president of the label, also continues to produce most of its CDs. Ginsburg, who left law school in 1992 to tend to the record label full time, comes from a family of prominent attorneys and legal scholars. His mother, Ruth Bader Ginsburg, is an associate justice of the U.S. Supreme Court. His father, Martin D. Ginsburg, is a noted tax law authority and professor at Georgetown University Law Center. His sister, Jane C. Ginsburg, is a law professor at Columbia University, specializing in intellectual property rights. From the outset, Ginsburg says his goal was to showcase Chicago's finest musicians in fresh and imaginative programs on audiophile-quality recordings. The native New Yorker saw in Chicago an abundance of stellar musicians who were ignored by East Coast, West Coast, and European record labels. With the right recording projects, Ginsburg believed he could advance their careers and serve the listening public in equal measure. Cedille would concentrate on attractive, off-the-beaten-path repertoire overlooked by the major labels. Mainstream classical works would show up rarely--and only in the context of innovative programs by artists who have enlightening and compelling interpretations. Cedille remains Chicago's only free-standing classical label. (The Chicago Symphony Orchestra has its own in-house recording operation.) Could Cedille have gotten off the ground today? Ginsburg has his doubts, mainly because of the difficulty of securing an effective wholesale distributor to sell to retail outlets. Physical CDs are still a vital part of the classical record business, even as digital downloads have gained in popularity, Ginsburg says. "There are only a few good independent distributors, and they're not likely nowadays to bother with a fledgling classical label with only a couple of discs in its catalog." New recording of the score from the TV series, plus original songs and speeches from WWII. Carl Davis, City of Prague Philharmonic Orchestra. Carl Davis Collection CDC006. 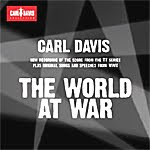 Composer Carl Davis (1936-) has given us any number of fine movie and television scores (The French Lieutenant's Woman, Napoleon, Pride and Prejudice), but his work on the monumental 1973 TV series The World at War is undoubtedly among his finest and most well-known work. The present album, which Davis conducted with the City of Prague Philharmonic in 2003, combines some of his original music for the series with vintage songs and speeches from World War II. The result is a sometimes touching, sometimes stirring, always impassioned musical experience. The program has a decidedly British bent, but that's understandable considering that although Davis was born in the U.S., he has spent most of his adult life in England. Additionally, the album presents only the conflict in Europe, with no mention of the War in the Pacific. So be it; there is only time to cover so much on a single compact disc. Things begin with a brief except from a speech by Prime Minister Neville Chamberlain introducing us to the War, followed by Davis's main theme for the show and a German march. Then we get three popular songs of the day: "Wish Me Luck as You Wave Me Goodbye" (Gracie Fields), "We're Going to Hang Out the Washing on the Siegfried Line" (Arthur Askey), and "Boum" (Charles Trenet), followed by an extended suite of original music, "France Falls," which shows us Davis at his most moving and melancholy best. You get the idea. Among the other pop songs of the day are Lale Anderson doing the sentimental "Lili Marlene," Irving Berlin in "This Is the Army, Mr. Jones," Anne Shelton singing "Coming in on a Wing and a Prayer," Flanagan and Allen performing "Run Rabbit Run," Carrol Gibbons with "I'm Going to Get Lit Up (When the Lights Go on Up in London"), Noel Coward and "London Pride," and Vera Lynn's heartrending version of "When They Sound the Last 'All Clear.'" In addition, we find the Red Army Choir doing "The Red Army Is the Strongest." Among Davis's additional original music include "Red Star," "G.I. Blues," "Arnhem Airlift," "Warsaw Aftermath," "Turkey Shoot," "Blood, Sweat and Tears," "Reckoning," and the end titles for "The World at War." His music is clearly influenced by composers like Bartok, Britten, Shostakovich, and even Chopin, which is as it should be since the music's evocative tones change as the War changes. Unlike the popular tunes of the day that reflect positive, optimistic, upbeat moods, Davis's music mirrors the realities of war, the untold horror, death, and destruction. The contrasts make the album that much more affecting. The sound varies, of course, according to the source material. The older songs from the late Thirties and Forties are obviously in monaural and limited in their fidelity. Davis's orchestral parts, as I've said he conducted and recorded in Prague in 2003. Here, you will find a big, wide stereo spread, miked very close up. It displays a robust vitality, a wide frequency response, and good dynamic impact in percussive sections. Yet the sound is somewhat soft, round, and veiled, too, perhaps to help it blend in better with the older selections. In any case, this 2010 album on the Carl Davis Collection label is a most-poignant affair, one that may have you shedding a tear or two, even if you're young and far removed from the actual War. The fact is, we're never far from war, and we need these kind of reminders of the pain and suffering that human beings seem always intent on inflicting upon one another. Bertrand de Billy, Vienna Radio Symphony Orchestra. OehmsClassics OC 640. 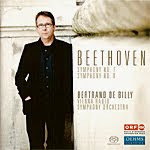 Maestro Bertrand de Billy's new performances of Beethoven's Seventh and Eighth Symphonies pretty much follow modern standards, meaning he adheres to the composer's tempo markings and includes all the repeats. For traditionalists like myself, this means the works lose a little of their old-fashioned charm, but there is no doubt they are exhilarating. Fortunately, de Billy never overreaches himself trying to breathe too much new life into these warhorses. The first movement of the Seventh, for instance, moves at moderately quick speeds, yet it never loses the spirit of the dance rhythms. He especially plays up the dynamic contrasts for maximum impact, yet, again, he never forces them down our throats. In other words, while de Billy observes the Vivace elements of the opening section, he never lets the music become hectic or frantic, maintaining a steady, deliberate pace that fully suits the music. The second movement Allegro moves at a faster and more constant speed than one usually hears, which emphasizes the staccato beat, combined again with wide dynamics makes it quite dramatic. The third movement Scherzo follows suit, the driving, energetic rhythms more naturally following the preceding two movements than most conductors care to provide. De Billy takes no breaks between the first and second and third and fourth movements, further pointing up the continuity of pulse and cadence established earlier, ultimately producing a bouncy yet seriously affective mood. The little Eighth Symphony has never enjoyed the popularity of Beethoven's more famous symphonies like the Third, Fifth, Sixth, Seventh, and Ninth, probably because one finds it rather buried in the middle of the rest and outclassed by them. It's something of a breather between the dashing Seventh and the monumental Ninth. Beethoven himself appeared to like his Eighth a lot more than his audiences did. Anyway, de Billy strikes forth boldly in Beethoven's opening Allegro Vivace, giving it enormous power and conviction, which he maintains throughout the work. It makes us see the music as anything but slight or frivolous, as people sometimes characterize it. That said, however, my own orthodox tastes are such that I wished he had been a little more flexible and actually lightened the tone a bit. Insofar as the sound goes, the engineers at OehmsClassics give us a beautifully balanced SACD, which the listener can play either in two-channel stereo as I did or in multichannel if you have the appropriate hi-fi gear. In stereo the sound nicely complements the performances, big and dynamic. Recorded in 2008-09, the sonics are at once smooth and mellow yet fairly well detailed and natural. Orchestral depth is moderate, transient response is impressive, and the studio's ambient bloom is pleasantly unforced. Finally, I should add that there are extensive booklet notes on both symphonies by Michael Lewin, who provides more insight and information than we normally find. Anke Hoffmann, soprano; Anneli Pfeffer, soprano; Peter Minich, tenor. 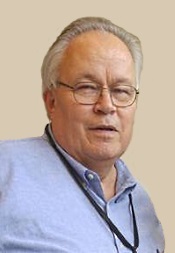 Helmuth Froschauer, WDD Rundfunkchoir and Rundrunkorchester. CPO 999 326-2. Hungarian composer Franz Lehar (1870-1948) is the fellow who gave Johann Strauss, Jr. a run for his money, or, if you will, succeeded the Viennese waltz king and continued on for many decades after Strauss's death. Lehar produced a number of charming operettas, the most familiar of which are probably The Merry Widow (1905), Count of Luxemburg (1909), and The Land of Smiles (1929). What we have here, though, is Lehar's 1902 operetta debut, Wiener Frauen ("Viennese Women"), a delightfully lightweight affair that seems at any moment to be lifted by a breeze and float off into the distance. Or maybe this is simply the way Maestro Frschauer and his company perform it. I rather suspect they give it their all, and all was not quite enough to lift it to any substantial heights. 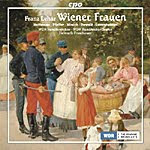 For listeners unfamiliar with the work--and that would include most of us since I'm not sure how often it's ever been recorded before, even in highlights--Wiener Frauen is typically comic and slight. It starts with a rather lengthy overture almost ten minutes long that contains the essence of the music, and much of it is quite appealing. Unfortunately, CPO do not include a libretto with this highlights disc, so you'll have to figure out what's being sung on your own. But they do include a booklet insert that lays out the general outlines of the plot. Or you can just do as I did and enjoy the delicious melodies and waltzes, many of which point toward Lehar's later music. The sound is another matter, however. While there is nothing wrong with it per se, a digital recording made between 2003 and 2005, it doesn't really sparkle, which is a shame because the music itself certainly does. The low end could be deeper, the midrange could be more transparent, the highs could be more brilliant, and the stage imaging could be deeper. In its favor, voices are smooth and natural. Oddly, perhaps, the disc also includes two overtures (Der Gottergatte and Wo die Lerch singt) recorded in 1971 and 1972 that sound better than the newly recorded operetta. The 1971 recording in particular has greater presence and dimensionality. I guess not everything improves with age. Pilar Lorengar, soprano; Klaus-Jurgen Wussow, narrator; George Szell, Vienna Philharmonic Orchestra. Decca 448 593-2. As I was listening recently to a new Naxos recording of Beethoven's complete incidental music to the play Egmont, I couldn't help thinking of and comparing it to George Szell's celebrated 1969 Decca rendering with the Vienna Philharmonic. Now, I thought it might be time to go back and mention that earlier disc because it is pretty special. Therefore, this is a new review of a 1996 remastering of a 1969 recording. When Vienna's Royal Imperial Court Theater decided to stage poet and philosopher Johann Wolfgang von Goethe's play Egmont in 1810 (thirty years after Goethe wrote it), they asked Beethoven to write the incidental music for it. Today, we don't see much of the play or the full score of the music, although the Overture has a remained a staple of the classical repertoire. With the Naxos disc, a little of the complete incidental music (beyond the famous Overture) went a long way, and some of it even became a tad tedious without the accompanying stage action, especially toward the middle of the work. But here, with Szell, things are different, and there is much in the music, singing, and narration to enjoy. The Decca disc may presently be a little hard to find, as I believe it's out print, but it's so good it's worth tracking down. The play itself is rather melodramatic, and Maestro Szell and the magnificent Vienna Philharmonic Orchestra play it up not only for maximum dramatic effect but for it subtlety as well. By comparison to other conductors in the work, Szell and the VPO are more highly charged in their music making. In other words, you'll find the opening Overture powerful, the march to the execution emotionally draining, and the closing "Victory Symphony" thrilling, with the quieter interludes in between totally charming. Soloist Pilar Lorengar cannot be faulted, her singing voice in the several vocal numbers exquisitely sweet and pure yet appropriately forceful. I hadn't remembered that the Szell disc included so much of the narration between each number, and narrator Klaus-Jurgen Wussow is positively inspired; I don't speak a word of German (the booklet insert contains translations), yet I loved just listening to the man speak. What with the orchestra's lofty playing, the soloist's poignant performances, and Szell's sublime conducting, this is a disc gets my highest-possible recommendation. As far as Decca's sound is concerned, recorded in the Sofiensaal, Vienna, it is highly dynamic, very clean, and exceptionally clear, with strong dynamics, a wide stereo spread, a solid impact, and a quick transient response. The orchestra is never unduly hard, harsh, or forward, the orchestral soundstage lacking perhaps only the last degree of depth and ambience. Although Ms. Lorengar's voice is a touch metallic at times, this is hardly even a quibble on my part. Great music. Great performance. Great sound. What do you think? Do I like it? Philippe Herreweghe, Royal Flemish Philharmonic. Pentatone SACD PTC 5186 316. Beethoven's Fifth Symphony is probably the single most recognizable piece of music ever written, at least its first movement, and justifiably so. It combines memorable tunes with tension and drama galore, raises one's spirit, and rushes the adrenaline. Which is exactly the way Philippe Herreweghe approaches it, directing his Royal Flemish Philharmonic Orchestra as he would any of the period-instruments groups he has lead over the years. 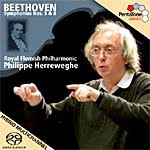 Herreweghe's Beethoven Fifth comes over with vigor, with verve, with energy in abundance, as he takes dashing tempos and accents the music at every opportunity with a theatrical panache that never sounds breathless or exhausting. He'll have your blood racing, almost in the way we think of Kleiber (DG) or Reiner (RCA) or the new Barenboim (Warner) doing it but without quite the voltage. OK, maybe it's more like Zinman (Arte Nova), actually, or possibly Norrington (Virgin), which is still saying a lot. Anyway, it is anything but conventional, and I liked it. PentaTone's sound is also good, whether you choose the regular stereo layer or the slightly cleaner and more dynamic multichannel SACD layer. The sonics remain quite smooth and natural, with plenty of bite and a bass drum that must have been recorded with a mike six inches away. That said, I didn't care as much for the accompanying Symphony No. 8. While the Fifth is all restive excitement and emotion, the Eighth should be a relative island of repose, replacing the Fifth's spectacle with outright charm. However, Herreweghe seems determined to prove that the Eighth is not as lightweight as some people claim, and I found his reading rather heavy-handed. Even the sound seems too thick for the occasion. Still, having so good a Fifth may be reason enough for rejoicing. Rodrigo: Concierto Andaluz; Assad: Interchange. 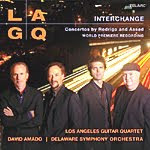 Los Angeles Guitar Quartet; David Amado, Delaware Symphony Orchestra. Telarc TEL-31754-02. This CD from Telarc is a "first" of several kinds: It's the first recording of a concerto by the Los Angeles Guitar Quartet; it includes the world-première recording of Sergio Assad's Interchange for Guitar Quartet and Orchestra; and it's the compact disc debut of the Delaware Symphony Orchestra. Oh, and there's also Joaquin Rodrigo's celebrated Concierto Andaluz at the center of things. Not a bad deal. 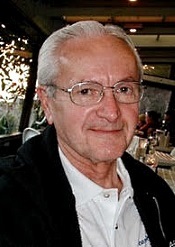 The program begins with Rodrigo's Concierto Andaluz, a work the composer wrote in 1965 expressly for the Romeros, the first family of guitar virtuosos. Naturally, I used their old Mercury (1967) and Philips (1978) recordings of the Concierto as comparisons and did not find the LAGQ's version lacking. The LAGQ are, if anything, even more intense than the Romeros in the opening movement, marked Tempo de Bolero. Although the tempo seems at first a little too fast paced, it quickly grows on you. Then the LAGQ attend to the charming Adagio that follows, lovingly molding and caressing it in a way that would make any of their mentors among the Romeros proud. Finally, they launch into the closing Allegretto with enthusiastic vivacity, again taking the music at a healthy clip. After Rodrigo's Concierto, we get Brazilian composer Sergio Assad's Interchange, which he wrote expressly for the LAGQ and whose content exactly matches the composition's title; namely, it's about the casual meeting of people on a four-level L.A. freeway interchange, the movements themselves referring to various roads and driving. The piece interweaves different musical styles from Brazilian to Spanish to Asian and Jewish, from Hollywood to jazz and blues, all of it tailored to the individual members of the Quartet. Interchange gets off to a rousing start with "Sephardic Passage," a movement that reminds one of something by Rodrigo with a kind of Hebrew overlay. Frankly, I was afraid that the new work was going to be one of those contemporary, atonal, cacophonous, avant-garde things, but it isn't. It falls squarely into the traditional classical framework and should be highly accessible to most modern listeners. I loved the flamenco and percussion elements of the second movement, "Gypsy Slopes," suggesting, perhaps, the ebb and flow of traffic. The quiet central movement, "Pacific Overlook," brings a note of tranquility to the proceedings with a pleasantly lilting melody; and that's followed by an even more leisurely jazz-inflected segment, "Forroblues Detour," that picks up steam as it goes along with an infectiously pulsating beat. Interchange concludes with a brief, colorful finale, "Crossings," that combines thematic threads from the four preceding movements. As I say, the Los Angeles Guitar Quartet along with Maestro David Amado and his Delaware Symphony Orchestra play the music as affectionately as one could want, combining commitment with fluency, grace, and high good spirits. And Telarc's audio engineers do their part in bringing the affair to disc with sound that is at once warm and smooth yet rich and acceptably detailed. While the stereo spread unfolds widely between the speakers, the four guitars appear nicely integrated into the whole without being unduly forward or engulfed by the orchestra. Still, as sweet as the sonics are, I kept wishing the Telarc disc possessed the kind of transparency and air displayed by the old Mercury recording of the Romeros. Ah, well, we trade ultimate definition for a realistically ambient bloom. Fair enough. Also, Guilmant: Marche sur; Vierne: Carillon de Westminster; Widor: Allegro vivace from the Sixth Organ Symphony. Philippe Belanger, organ; Yannick Nezet-Seguin, Orchestre Metropolitain. ATMA Classique ACD2 2540. The prolific composer Camille Saint-Saens (1835-1921) once said of himself that he was "like a tree producing leaves." At the time the Philharmonic Society commissioned him to write the Symphony No. 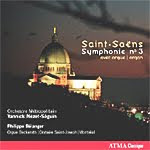 3, the so-called "Organ" Symphony, audiences already recognized him as the greatest living French composer. Today, we know him chiefly for his opera Samson et Dalila, the orchestral Carnival of the Animals, the Second Piano Concerto, the little Dance macabre, and, of course, the Third Symphony, among many other things. It's a commendable output. The Symphony No. 3 is a colorful, at times bombastic, but thoroughly enjoyable piece of music, with the organ taking a commanding part in the Adagio and the second segment of the Finale. Yannick Nezet-Seguin, Montreal's Orchestre Metropolitain, and organist Philippe Belanger attack the music with gusto. But for me the test of any reading of the Third Symphony is the Adagio. The organ should wash over the listener in deep, gentle waves. The ATMA recording almost does just this thing, and certainly Belanger gives it his best shot. By the time the fireworks begin in the final third of the piece, the players are well up to the challenge, and both the organ and the orchestra ring out authoritatively. It is perhaps a shame, actually, that one has to make comparisons, but it's inevitable. The two benchmarks that stand out for me are the performances by Charles Munch and the Boston Symphony Orchestra (RCA) and by Louis Fremaux and the City of Birmingham Symphony Orchestra (EMI), both of which provide an extra spark, an additional note of exhilaration, missing from Nezet-Sequin and his forces. ATMA's sound, recorded in 2005, is remarkably smooth, with adequate inner detailing; yet for so robust an organ recording the midrange and high end seem a bit too thin and warm, lacking the last degree of richness and sparkle. Nevertheless, there is a fine hall ambience here that will not displease most listeners. Filling out the album are the three pieces for organ listed above, all of them sounding a touch billowy but well performed, with some really strong bass for those who enjoy their subwoofers. Also, Quartettsatz. Borodin String Quartet. Virgin Classics 59099 522099 2 5. I've been listening to this 2008 reissued EMI/Virgin Classics disc quite a lot in the past year or so. The first few times, I was sitting in front of the speakers in the living room; another time I was eating breakfast and reading the paper. Is there ever a bad time to listen to Schubert? He was quite the prolific composer, and it's a shame he died in his early thirties as he could have given us so much more. OK; be grateful for what we have. In any case, what we have here are quartets from his earliest and a later periods. The first item is the String Quartet No. 10 in E Flat, D.87, which Schubert wrote in his teens. It's lighthearted, and lightweight, and overflows with good cheer. The next, from 1820, is an unfinished piece, the Allegro Assai from a work he titled Quartettsatz. One has to wonder why he never wrote anything more around it. The third and most important work on the disc couldn't be more different from the first two; it's the String Quartet No 13 in A minor, D.804, known as "Rosamunde" because the composer recycled the second movement from his "Rosamunde" ballet music of several years earlier. D.804 is more solemn, more melancholy, more mature, and more original than the other two pieces, perhaps reflecting the man's illness at the time of its composition. The Borodin String Quartet capture the changing moods of the three works effectively, and the EMI/Virgin engineers in a recording made in 1991 maintain the tone of the composer and his works in sound that is at once warm, slightly soft, full, yet reasonably clear. It's a pleasant album that I look forward to hearing many times over. Beautiful music; beautiful playing; more than adequate sound. And to make the deal even sweeter, I notice that dealers at Amazon are selling the disc new for around five bucks. Half that if you want it used. It's a tempting proposition. 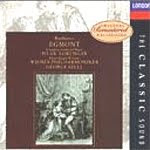 Also, Rameau: Les Boreades ballet suite. Simon Rattle, Berlin Philharmonic Orchestra. Medici Arts 2057558. The DVD keep case notes that "this 1993 recording must be hailed as a document of supreme historical importance as it is the first audio-visual live recording of a concert given by Sir Simon Rattle and the Berliner Philharmoniker. Six years later the orchestra voted by a large majority to appoint Rattle its new principal conductor and artistic director in succession to Claudio Abbado." The hyperbole of "supreme historical importance" aside, it is a meaningful event, not only because we get to see Rattle leading the Berlin players but because he so fervently leads them in so diverse a program of French music. 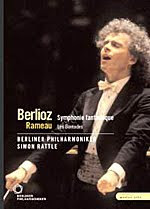 Rattle chose for the event Rameau's ballet suite for Les Boreades, a purely Baroque composition for small-scale ensemble, and Berlioz's Symphonie fantastique, a thoroughly trailblazing Romantic work for a decidedly large-scale orchestra. It's a wonderful juxtaposition of musical extremes, Rattle leading both of them with almost youthful zeal. The concert begins with the music of Jean-Philippe Rameau (1683-1764), and Rattle using a trimmed-down Berlin Philharmonic. He does up the suite's twelve movements with energy and élan, the video portion of the disc pointing up Rattle's apparent delight in the undertaking as he practically grins from ear to ear while conducting the piece. Then we get the Symphonie fantastique, written by Hector Berlioz (1803-1869) when the composer was only in his mid twenties and pining (in the music and in real life) for a lost love. The piece paved the way for more innovations in musical themes and orchestrations, and Rattle seems to take pleasure in making sure we know about it. Unlike the conductor's more-recent Berlin Philharmonic treatment of the work on an EMI compact disc, this earlier performance (some fifteen years earlier) shows far more animation, color, and character. Maybe Rattle is slowing down with age, becoming more cautious; I don't know. In any case, here he appears to put more energy into the proceedings. In the "Reveries" Rattle is passionate; in the waltz at "A Ball" he produces a charming lilt; and in the "Scene in the Country" he introduces an ironically bucolic atmosphere. Then we come to the two most-famous movements, "The March to the Scaffold" and "The Dream of a Sabbath Night" (or Witches' Sabbath), both of which Rattle treats more with grace and style than with outright mischief or fury, but then he lets loose in the closing minutes. This is basically a forthright rather than wholly exhilarating interpretation, the conductor allowing the composer do most of the work, which for Berlioz works out just fine. In terms of the disc's video presentation, it comes in a basic, Nineties television-broadcast 1.33:1 aspect ratio, the picture a tad soft and fuzzy, even by standard-definition yardsticks. The most refreshing thing about the video is being able to see the look in Rattle's eyes and the expression on his face as he conducts, something a conventional audio-only CD obviously doesn't permit one to do. Insofar as the audio is concerned, the DVD comes with three formats: PCM stereo, Dolby Digital 5.1, and DTS 5.1. As with other comparisons I've made of classical-music DVDs using these formats, the PCM stereo sounds the smoothest and warmest of the three but the least clear; the Dolby Digital 5.1 adds more ambient bloom in the surround speakers; and the DTS 5.1 seems the most dynamic and transparent, albeit at the expense of being slightly brighter. I listened (and watched) first in my home-theater room using a 7.1 speaker setup and then in my living room using two speakers. I switched around a good deal among the three audio formats and found that none of them matched the sound on a well-recorded, well-transferred CD. All three of the DVD's audio formats appeared veiled and dull by comparison. And, of course, there is the audience noise to contend with, which is, in any case, a part of what makes the audio-video experience appealing to a lot of folks. The entire concert lasts about an hour and a half, the disc includes a menu and chapter index, and the keep case comes with a handy informational booklet insert. Also, Mozart: Sinfonia concertante in E flat major; Elgar: Nimrod. Daniel Barenboim, West-Eastern Divan Orchestra. 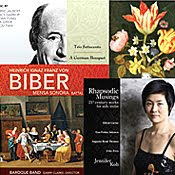 Warner Classics 2564-62791-2. 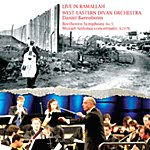 This live concert album is subtitled "Barenboim's orchestra plays for peace in Ramallah." For good reason, as his youth orchestra, which he co-founded with Palestinian Edward Said in 1998, is made up of young players from both Israel and Arab countries, all working together to unite people in the joy of music. If this concert is any indication, they're on the right track. Things begin with Mozart's Sinfonia Concertante in E flat major for oboe, clarinet, bassoon and horn, K297b. It's a peppy little work, yet under Barenboim's baton, it displays much inner warmth, serenity, and wit as well. Then comes the centerpiece of the show, Beethoven's Symphony No. 5, possibly the most well-known piece of classical music in the repertoire, which the conductor plays with fire and enthusiasm. You'll find everything here you've come to expect from the Fifth Symphony and more, Barenboim pointing up the work's tense explosiveness and doing so at speeds that approach those of Fritz Reiner in his old RCA Chicago Symphony account. OK, maybe the performance lacks the ultimate electric charge of Reiner's performance or of Carlo Kleiber's DG recording, but it does come close with its involvement, its fury, its energy, and its passion. And to think that it is a youth orchestra performing at this high level and with this precision is quite remarkable. Following the Beethoven, Barenboim gives us a brief, four-minute speech about his orchestra and how proud he is of them, saying he hopes the example of their willingness and cooperation will be an inspiration for understanding amongst all peoples. Then he concludes the program with an encore, the "Nimrod" segment of Elgar's Enigma Variations. It is quite beautiful and makes a fitting close to the concert. The recording, made in Ramallah's Cultural Palace in 2005, is about what we have come to expect from miking a live event; namely, the sound exhibits a slightly veiled presence, with good dynamics but not a lot of essential clarity or orchestral depth. While the stereo image is admirably wide, the sonics are also rather close up, yet without a lot of sparkle. So, we get good performances here in somewhat indifferent sound. Also, Beethoven: Egmont Overture; Dvorak: Symphony No. 9; Verdi: Overture to "I vesperi siciliani." Gil Shaham, violin; Claudio Abbado, Berlin Philharmonic Orchestra. Medici Arts 2051958. Here is a classical-music DVD worthy of one's attention. It features a world-class orchestra and conductor performing a program over 100 minutes long. It may not contain the greatest interpretations of any of the music, but it's more than satisfying in its playing and sound. 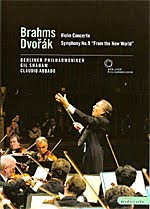 Claudio Abbado and the Berlin Philharmonic recorded the concert live on May 1, 2002, in Palermo's newly restored Teatro Massimo, one of Europe's finest halls. As always, a classical-music DVD is mainly for people who enjoy watching an orchestra perform as much as they enjoy listening to the music, and it is not particularly for audiophiles who want to hear the absolute best fidelity from their sound system. As such, this Medici Arts disc provides a fascinating glimpse into the conducting style of Maestro Abbado as well as a look inside the glorious Teatro Massimo. But, fortunately, the music is not bad, either. The concert begins with Beethoven's Egmont Overture, which Abbado does up in properly brawny, heroic style. Next is Brahms's Violin Concerto in D major, Op. 77, with violinist Gil Shaham. The soloist, conductor, and orchestra treat the work with a sweet spirit, light and lyrical, providing a nice bounce in the Allegro finale. Then we come to Dvorak's big gun, the Symphony No. 9, "From the New World," thrustful, rhapsodic, melancholy, jaunty, and exhilarating by turns, with Abbado and company in complete command. Finally, in a nod to the Sicilian setting, the program ends with Verdi's I vespri siciliani, where, interestingly, the bass finally makes its presence known. Abbado provides the kind of thoughtful, refined, yet red-blooded, exciting, and invigorating interpretations for which audiences have always known him, his soloist is affecting, and his orchestra is as rigorously precise and rich-sounding as ever. These are first-rate if not quite absolute top-drawer performances. The video is in a 1.78:1 widescreen format, so if you have a widescreen TV, it will fill every square inch of it. The picture looks very slightly faded and soft, as we might expect from a standard-definition television broadcast. The audio comes in three formats: PCM stereo, Dolby Digital 5.1, and DTS 5.1. In surround, to which I listened (and watched) initially in my home-theater room, the DTS sounded marginally more dynamic and more open than the others, although a bit brighter, too. On the other hand, the Dolby Digital appeared smoother and less congested at the high end. In regular stereo in my separate living-room system, I preferred the straight PCM 2.0 track, which seemed more effortless under these conditions. Still, I would have preferred something more in the way of sparkle, transparency, and orchestral depth from all three formats. Which format you choose, I'd say, is purely a matter of personal preference for your own listening needs. Also on the disc you'll find a main menu containing chapter selections; the bonus of a twenty-minute look at the city of Palermo, "A Portrait of Palermo," with an emphasis on its cultural life (narrated in German but available with English, German, French, Spanish, and Italian subtitles); and several trailers for other classical-music DVDs. In addition, the keep case includes a booklet of notes on the music and the musicians. Also, Vocalise, Op. 34, No. 14. Leonard Slatkin, Detroit Symphony Orchestra. Naxos 8.572458. It is quite a feather in Naxos's cap to have so distinguished a conductor as Leonard Slatkin, now Music Director of the Detroit Symphony Orchestra, recording for them. Slatkin had long been associated with RCA, EMI, and other labels, where he made over 100 fine recordings. Naxos acknowledges the present disc, one of several Slatkin has made for them over the past few years, by affording the jewel box its own slipcover, always a sign of a prestige product. This time out, Maestro Slatkin tackles that twentieth-century holdout of old-fashioned Romanticism and mainstay of the basic repertoire, Rachmaninov's Second Symphony (1908). Above all, the Symphony demands fervor and passion, which, for better or for worse, Slatkin serves up only in brief moments of enthusiasm. Mostly, the conductor gives us a secure run-through, emphasizing the work's more lyrical elements rather than its splashier dramatics. So the brooding first movement is just that: more meditative, thoughtful, and subdued than electrifying. Slatkin begins to hit his stride in the quicker second-movement Scherzo, though, where the temperature rises significantly from the preceding segment. Following that, the Adagio comes across with an abundance of wistful longing, and it's here that Slatkin is at his absolute best. Although his tempo is actually a touch fast for my taste, he imbues the music with an appropriate melancholy. In the Finale, marked Allegro Vivace, Rachmaninov seemed determined to out-Tchaikovsky Tchaikovsky with a huge, theatrical production. Slatkin gives it his best shot, while maintaining some degree of decorum until the very end, where he plainly gives in to the composer's demand for plenty of juice. I would count Slatkin's interpretation as very good, without quite reaching the intensity of, say, a Previn (EMI), a Jansons (EMI), or a Rozhdestvensky (Regis). As a fill-up, we find Rachmaninov's Vocalise, also well rendered. 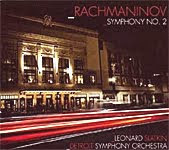 Naxos recorded the performances in Detroit's Orchestra Hall during live sessions in September of 2009, where they obtained a dynamic if not entirely transparent result. OK, I admit I'm still spoiled by all those old Mercury recordings of the Detroit Symphony from the Fifties, so wonderfully remastered some years ago on CD and SACD. By comparison, the Naxos disc sounds firm and clear but a little tame, despite a couple of solid bass whacks. Frank Beerman, Johannes Goritzki, German Chamber Academy Neuss. CPO 777 137-2 (two-disc set). It must have been at least a little trying for court musician and composer Michael Haydn growing up and living in the shadow of his more-famous older brother, Franz Joseph Haydn. Yet Michael did pretty well for himself, composing more than 800 works in all the genres of his day. Of course, little of his work is as wholly inventive or delightful as his brother's and by comparison to the sheer number of recordings of his older brother's compositions, Michael Haydn's recorded output is relatively small, which is as it should be. While younger brother Michael has his moments, they are nowhere near as many or as memorable as his brother Franz Joseph's. 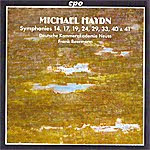 The present two-disc collection represents a fair assessment of Michael Haydn's abilities, containing eight of his symphonies and three of his marches, the set comprising part of an ongoing series of the composer's music on CPO Records. Let me run down the contents in the order of their arrangement on the discs. Starting on disc one are the Symphonies Nos. 33 and 29, both pieces quite festive, jocular, and jaunty. Following them is No. 19, which is more ceremonial than the first two; and closing disc one is Symphony No. 24, very lively and animated throughout. On disc two we find the little Symphony in F major, melodic and catchy; followed by Symphony No. 14, notable for its second-movement Adagio's bassoon part, probably the most affecting music in the entire set. Next, we get No. 17, for which the composer drew upon earlier material; and then Michael Haydn's last two symphonies, Nos. 41 and 40, both fairly brief yet charming and mature. The program concludes with three very short, two-minute Marches. The German Chamber Academy Neuss, under the direction of Frank Beerman in the first seven symphonies in the set and Johannes Goritzki in the final five, play with precision, faithfulness, and accuracy above all. As a result, they can seem to some degree reserved, restrained, despite the generally quick tempos they adopt throughout. I have to admit there is a sameness about all of the music that makes listening to more than a couple of symphonies at a time a tad fatiguing. CPO's sound, recorded in 2004 but only just released in late 2009, is warm and smooth to the point of appearing too refined. Although I would have preferred a little more sparkle at the high end and a little more bass at the low end, the sonics nicely complement the somewhat sedate and scholarly performances. Orchestral depth and instrumental transparency are modest, whilst left-to-right imaging is excellent. The set also includes extensive booklet notes in English, French, and German to keep you busy should your mind wander. Also, "Ah! perfido," Op 65; Marches Nos. 1 and 2. Madeleine Pierard, soprano; Claus Obalski, narrator; James Judd, New Zealand Symphony Orchestra. Naxos 8.557264. Admittedly, a little of this complete incidental music (beyond the famous Overture) on Naxos goes a long way, and some of it even becomes a tad tedious without the accompanying stage action, especially toward the middle of the work. Still, there is much in Beethoven's music to enjoy, and it is always good to have so economical a recordings as this new budget Naxos release of the complete score, recorded so well. The play itself is rather melodramatic, and conductor James Judd and his New Zealand Symphony play it up not only for maximum dramatic effect but for it subtlety as well. In other words, you'll find the opening Overture and the closing "Victory Symphony" quite exciting and the quieter interludes in between equally charming, if, as I say, sometimes a bit redundant. For quite a while, my own favorite recording of the music has been that of George Szell and the Vienna Philharmonic, made by Decca in the late Sixties, issued by them on CD in the Eighties in highlights form, and reissued complete on CD in the Nineties. 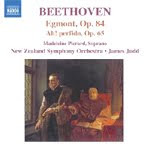 I have to admit that by comparison Szell and the VPO are more highly charged than Judd and his New Zealanders, but Judd comes close, and many listeners will prefer him at the price. Soloist Madeleine Pierrard has a lovely singing voice in her several numbers; Claus Obalski is in fine, mellifluous voice for his brief narration; and the New Zealand Symphony perform in their usual highly disciplined manner. Filling out the program are two of Beethoven's little Marches, WoO 18 and 19, which he called his "music for horses"; and the Scena and Aria "Ah! perfido," Op. 65, in which Ms. Pierrard again sings most sweetly. As far as Naxos's sound is concerned, it is fairly dynamic, with a modestly wide stereo spread, although it is also slightly soft and warm and displays little orchestral depth. Nevertheless, the acoustic is flattering, and the smooth, realistic concert-hall sound is entirely listenable. This is certainly an attractive album and well worth investigating. Also, Stravinsky: The Firebird Suite. Eugene Ormandy, the Philadelphia Orchestra. EuroArts 2072258. 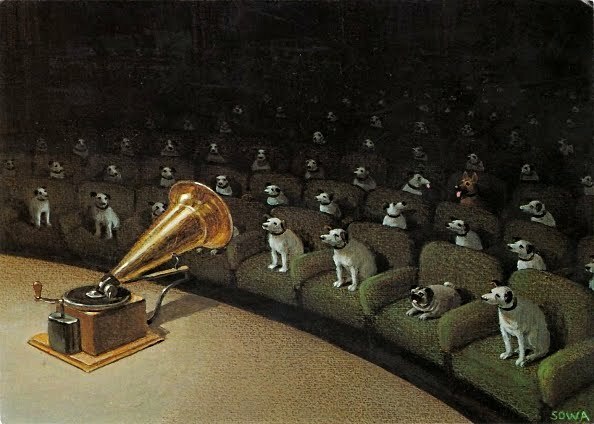 Some years ago, a friend asked me if I was one of those guys who sat in front of his speakers and simply listened to music. I said yes. He said, "That's sort of like meditation, isn't it?" I hadn't thought about it that way, but it did remind me that most folks don't actually listen exclusively to music. Instead, they're reading a book or a magazine; eating their lunch or dinner; doing their homework; working around the house, etc., when they're playing music. One of the important things that surround-sound in home theater systems has done for music listening is that it has often forced people to sit in the optimum listening position in front of the television and actually listen. At least, sometimes. Which brings us to the point of the review: This EuroArts disc is a audio-video DVD for people who enjoy watching something while they're listening. 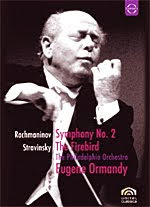 On the disc, Eugene Ormandy conducts the Philadelphia Orchestra in live 1977 and 1979 performances of Igor Stravinsky's Firebird Suite and Sergei Rachmaninov's Symphony No. 2. They are not the greatest performances in the world, nor is it the best sound in the world, but it is a nice change of pace seeing a world-famous conductor leading a world-class orchestra. Things begin with the Firebird music, which, of course, is colorful and characterful, with Ormandy doing his best to maintain the mystery and excitement of the piece. Then we get about nine minutes of Ormandy introducing the Rachmaninov, in which the conductor reminisces about his long friendship with the composer, complete with amusing anecdotes. Anyway, while there is much talk in the booklet notes about how neither Ormandy nor Rachmaninov liked the cuts often taken in the score by so many other conductors, it appears that Ormandy took a few here himself. That and the fact that Ormandy rather races through some of the movements makes his interpretation somewhat shorter than most complete versions. Insofar as the sound is concerned, the DVD provides three formats: PCM stereo, Dolby Digital 5.1, and DTS 5.1. Of the three, the PCM comes across as the most natural, Dolby Digital seems to provide the most orchestral depth, and DTS appears to be the most dynamic (although also the brightest). I reviewed the disc on two separate systems: First, in my home-theater setup using 7.1 speakers and a widescreen Sony XBR television (the disc's video derives from a typical, standard-def, 1.33:1 ratio broadcast of the Seventies) and afterwards in my living-room music setup in ordinary two-channel stereo, sans TV. In both instances and in all three audio formats, I thought the sound lacked much bite, detailing, transparency, treble extremes, deepest bass, and transient impact. Worse, I found the audience noise so intrusive, I was aware of it at all times. This constant background noise is mitigated somewhat when one's mind is centered on the video, but it's still present. Nonetheless, as I've said, you don't buy these kinds of classical music videos for their audiophile sound qualities but to see and hear a live event. In this regard, the disc works fine. String Quintet; String Quartet in G; String Quartet in D minor, "Death and the Maiden." Belcea Quartet, with Valentin Erben. EMI 50999 9 67025 2 (two-disc set). There is a good deal to recommend this new two-disc set from the Belcea Quartet and their guest, cellist Valentin Erben, not the least of which is the set's content. It includes some of the last chamber works Franz Schubert (1797-1828) wrote, and it turns out to be some of his most popular and most mature music. Things begin with the String Quintet in C, D956, in which Valentin Erben lends additional weight to the proceedings with his cello. The composer's use of five instruments rather than four makes for a richer, more substantial-sounding piece. 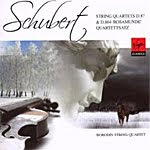 Schubert wrote the String Quintet in 1828, the last year of his short life, and it was his final chamber work of any kind. There is a longing wistfulness about all of the music; a wonderfully delicate Adagio that projects an ethereal state, with a surging, tempestuous center; and a closing Allegretto with a Gypsy-like flair. It provides a glimpse of what might have come had the composer lived longer. Next is the String Quartet No. 15 in G, D887, written in 1826, Schubert's last quartet. Although it is not his most-popular piece of music (the opening movement overstays its welcome), it is one of his most varied and emotional. Yet it is not exactly the kind of light, lyrical material we usually associate with the man. The set concludes with String Quartet No. 14 in D minor, D810, "Death and the Maiden," the dark, foreboding, highly charged work that remains among Schubert's most celebrated creations. To say that the Belcea Quartet pull off all three compositions with style and refinement would be an understatement. Violinists Corina Belcea-Fisher and Laura Samuel, violist Krzyzstof Chorzelski, and cellist Antoine Lederlin appear more interested in nuance of expression than in flashy showmanship or extrovert bravado. 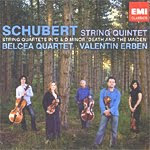 With Schubert, this works perfectly, the slow movements especially characterful and sympathetic. Some of the Quartet's music-making can carry one away with enchantment. Complementing the fine performances, the EMI sound engineers capture the players well spread out across the sound stage and close enough to the listener to simulate a live presentation a few dozen feet away. The engineers also secure well-defined instruments set amidst a realistically rendered acoustic, that of Potton Hall, Suffolk, during their recording sessions in 2009. The sonics tend to make the four or five performers seem perhaps a little larger than they probably appear live, but the effect nicely enhances one's listening enjoyment. With good clarity and transparency, without any hardness or glassiness, this is vintage EMI sound. If there is any drawback to an otherwise splendid production, it's that the uncut performances necessitate No. 15 be spread over the two discs, the first movement on disc one and the final three movements on disc two. Ah, well, a minor inconvenience at worst.